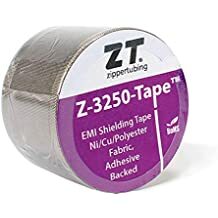 Z Shield Al - Z Shield - Trade Names - ZT | Zippertubing Co.
Z-Shield® is a wrap around EMI-shielded jacket made of fire retardant Polyurethane film, EMI shielding cloth or foil and an adhesive closure. This combination provides excellent electromagnetic shielding of wires and cables in applications requiring outstanding flexibility, flame-retardancy and good dielectric strength. Extremely useful in electronics applications where space may require a thin and flexible shielding. These products can be configured to fit most Round, Flat or Rectangular cable configurations and is available with or without a drain wire installed. 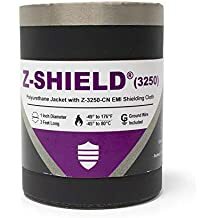 Z-Shield® is a wrap around EMI-shielded jacket made of fire retardant Polyurethane film, EMI shielding cloth or foil and an adhesive closure. This combination provides excellent electromagnetic shielding of wires and cables in applications requiring outstanding flexibility, flame-retardancy and good dielectric strength. Extremely useful in electronics applications where space may require a thin and flexible shielding. Z-Shield® can be configured to fit most Round, Flat or Rectangular cable configurations and is available with or without a drain wire installed. 0.25" 0.375" 0.5" 0.625" 0.75" 0.875" 1.0" 1.25" 1.5" 1.625" 1.75" 2.0" 2.25" 2.5" 2.75" 3.0" 3.25" 3.5" 3.75" 4.0"
Z-Shield® (AL) is a wrap around EMI shielding jacket made of fire-retardant Polyurethane film, SH1 EMI shielding foil, and an adhesive closure. This combination provides excellent electromagnetic shielding of wires and cables in applications requiring limited flexing, flammability to UL224, VW-1, good dielectric strength and no re-entry. Extremely useful in electronics applications where space may require a thin and flexible shielding. This product can be configured to fit most Round, Flat or Rectangular cable configurations and is available with or without a drain wire installed. This is an ideal product for flat cable shielding applications. Z-Shield® (AL) will cross reference to Chomerics CJ-021 Jacket. This product has an operational temperature range of -53° to 80°C (-63.4° to 176°F). Cable Diameter 0.25" 0.375" 0.5" 0.625" 0.75" 0.875" 1.0" 1.25" 1.5" 1.625" 1.75" 2.0" 2.25" 2.5" 2.75" 3.0" 3.25" 3.5" 3.75" 4.0"